Nationl and international experts here stressed on urgent concerted efforts of South Asian governments to ensure transparency, accountability and integrity in utilising the fund for the climate victims. ‘As the South Asian countries have prioritised adaptation over mitigation, the governments in this region must mainstream adaptation into their regular developmental portfolio by ensuring transparency and accountability of climate-financed projects to meet diverse needs of the divergent local community in the region’, they observed during a two-day international dialogue that concluded in the capital on 19 September 2017. Organised by Transparency International Bangladesh (TIB), experts from India, Nepal, Australia, the Maldives, the Netherlands, the UK, Thailand and Bangladesh convened in ‘Dhaka Integrity Dialogue 2: Climate Finance and Governance in South Asia’, held from 18-19 September 2017 at the Bangabandhu International Conference Center (BICC), Dhaka. The objective of the dialogue was to identify the prospect and challenges in climate finance governnace and explore the potential scope, ways and means of regional efforts to meet SDG13 and the Paris Agreement in the context of good governance in climate finance. The speakers agreed that transparency at both demand and supply sides of climate finance are equally important, therefore, integrity practices by both financiers and recipients are impeartive for effective implementation of CF projects. The speakers also urged the climate community to explore innovative ways to engage the private sector. There was unanimous consensus among the speakers that adopting principles of equity, participation, responsiveness and ownership are pivotal to enhancing transparency in adaptation finance for the benefit vulnerable communities. During different sessions of the dialogue, the speakers also highlighted on various mechanisms that can be leveraged for finance to ensure long term sustainability and scalability of adaptation programs, and urged all to consider adaptation efforts as global public good and stressed on various options, not only grant, for sustainable scaling of climate finance. Speakers observed that incentive based policies to promote energy efficient production and consumption should be prioritized to reduce greenhouse gas emissions in these countries. Presided over by TIB Executive Director Dr Iftekharuzzaman, Chief Guest of the concluding session on Tuesday Mr. Mohammed Iqbal Hossain, Deputy Comptroller and Auditor General (AG) of Bangladesh (Senior), Office of the Comptroller and Auditor General underscored the need of transparency and accountability in climate funded projects. He said, as part of the process to ensure transparency in the funding process, the office of the CAG is now auditing climate resilience fund and Climate Change Trust Fund, and the audit report will be published shortly. Six audit reports on climate financing have already been discussed in the Jatiya Sangsad, he added. Dr. Iftekharuzzaman emphasized on the need for working together for promoting transparency, accountability, integrity at national, regional and international levels in the use of climate funds. Presenting abrief summary of the dialogue in the concluding session,Professor Dr. Sumaiya Khair, Adviser, Executive Management, TIB stressed on synergies between the needs of developing countries and support of international cooperation on adaptation efforts in the region. Topics such as Bangladesh and the Maldives case studies on adaptation finance governance, building capacities to access to green climate finance by South Asian countries and developed and developing country perspectives on transparency framework under the Paris agreement, and SDG and Climate Change from Finance and Governance Perspective were also discussed during the four plenary sessions of the concluding day. The speakers stressed on concerted efforts to link climate finance issues with the broader country-specific democratic governance situation, without which the climate adaptation projects would fail to produce the desired outcomes. The speakers also stressed on simplifying the rather cumbersome approval processes of Green Climate Fund. The speakers further observed that the quality of governance, institutional integrity and regulatory frameworks would be critical to achieving the relevant SDG goals. They also underpinned the necessity to ensure minimum governance standards for monitoring of climate adaptation finance by the public sector. Different plenary sessions on the first day focused on progress, challenges and way forward of climate finance in vulnerable developing countries; adaptation finance in South Asian countries; a methodological study on unbundling pledges of South Asian Countries. 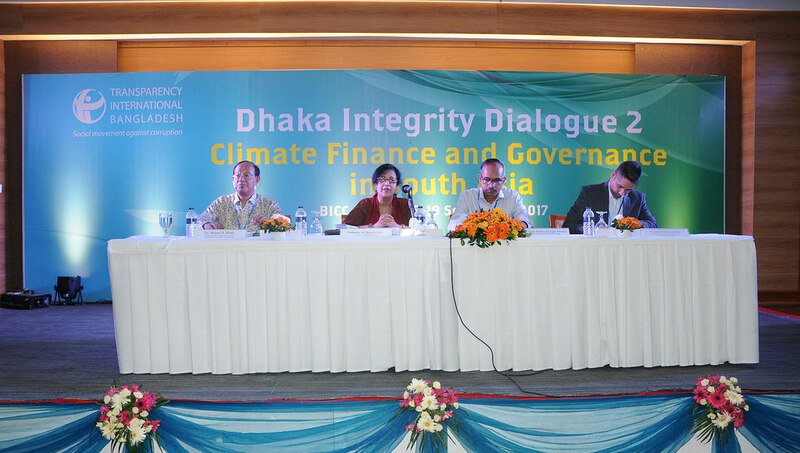 It may be mentioned here that the first integrity dialogue in adaptation climate finance organised by TIB was held in Dhaka in March 2016. Since 2011, TIB has been playing pivotal role in climate finance governance research and advocacy in Bangladesh for ensuring integrity, transparency, accountability and participation in all types of climate funds in Bangladesh.